All website Pictures (c) 2003- 2018 for BWAPR. No reposting to other websites, books, magazines, etc. All others require strict written consent. BWAPR . By entering this website you accept and agree to the terms and conditions set forth when using it's products, rental items, services and this website. Thank you. 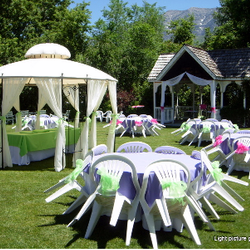 Welcome to Budget Wedding & Party Rental professional event services. Founded in 2003 and providing professional event services with thousands of satisfied customers, corporations, wedding planners, event centers, caterers and more. Winter is here and Spring is just around the corner. Please book early as dates fill rapidly. We appreciate your business and look forward to meeting with you. Our goal: To make the event services and decor for your event as memorable and hassle free as possible. Choose from our wide selection of modern and up to date fabrics, hundreds of colors, specialty fabrics, backdrops, center pieces and so much more. 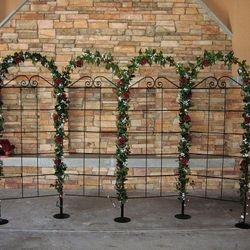 Take a look at our rental items page. 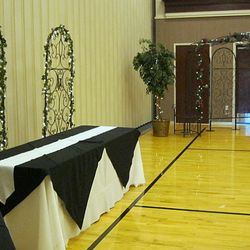 We offer full setup/tear down of your event as well as delivery and pickup to most locations (church cultural halls, event centers, backyards, parks, etc.). Our entire inventory isn't shown so please let us know what your looking for. Established since 2003. For a free consultation, please call 801-787-7277 to schedule an appointment. 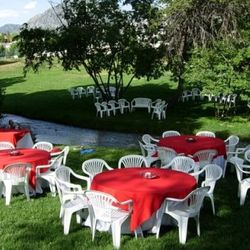 Find us on Facebook "Budget Wedding And Party Rental". Like us on Facebook, let us know. Thanks! TM "The Only Thing Budget About Us Are The Prices"